One of the reasons I buy a good guidebook before traveling to a new section of the country is because invariably descriptions of places I wasn’t aware of pique my interest. Such was the case for our road trip to several national parks in southern Utah. As I read about the rivers and trails of Canyonlands National Park, one site kept popping up—the Overlook at Dead Horse Point State Park. 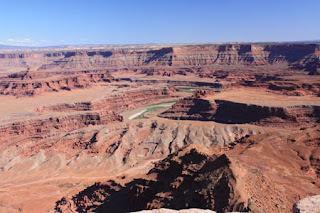 Stunning views of mesas and canyons at Dead Horse Point S. P.
Located in the southeast corner of Utah on the northeastern fringe of Canyonlands this place is definitely worth a visit. Surrounded by spectacular vistas of the adjacent national park, the panorama from Dead Horse Point is simply stunning. Standing on the canyon’s rim, you’ll see changes in rock formations wrought during 300 million years by the forces of wind and water. 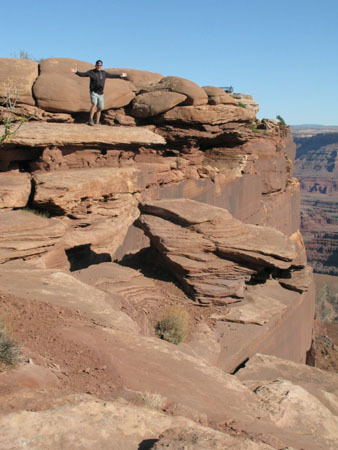 From the ridge you’ll overlook sheer cliffs where the Colorado River twists and turns and meets up with the Green River. You’ll marvel at distant mesas and deep canyons that have been carved through sandstone. Massive buttes and sculpted pinnacles offer scenery among the most breathtaking in the U.S..
Dead Horse Point is actually a peninsula connected to a large mesa by a narrow strip of land. According to legend, around the beginning of the 20th century, the point was used as a natural corral for wild mustangs roaming the mesa top. Cowboys rounded up these horses, herded them across the 30-yard wide strip and onto the point where they fenced in the horses. After the cowboys chose the desirable horses, the rest were released. But high cliffs and confusing topography prevented escape for those that remained. Eventually the horses died of thirst as there was no water—except the Colorado River 2,000 feet below. Today visitors enjoy paved paths (walk as much or as little as you want—Larry and I like to explore off-path), self-guided nature trails, and ranger programs during the summer months. Ten miles of hiking trails and a picnic area are available. too. The campground fills quickly in summer (make reservations) but is also open in winter. Interpretive exhibits at the year-round Visitors Center share the culture, geology, and history of the region. 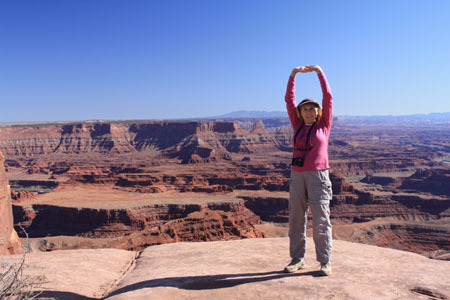 From Moab, head northwest 10 miles on U.S. 191, then go 22 miles on Hwy 313. Four scenic areas along the highway provide excellent photography stops. After admiring the views from Dead Horse Point State Park, continue on to the Island in the Sky district of Canyonlands National Park to round out your day of sightseeing.